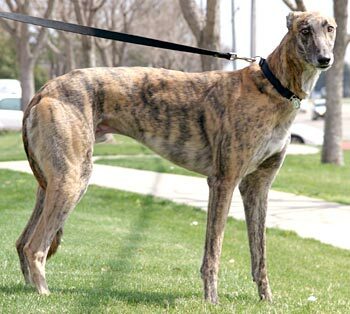 Duke, aka Duke Devil, is a striking, brindle, 6-year-old male born May 15, 2006. His sire is the Irish-bred Pacific Mile and his dam is Out of Line, making his grand sire Gable Dodge. 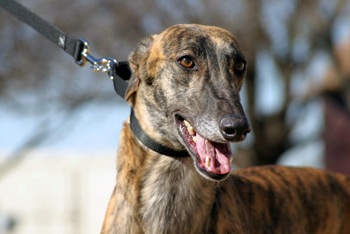 Duke's 8-race career started at Valley Race Park in Harlingen on December 12, 2007, and ended there on January 20, 2008. Duke was in a home for four years, but has since returned to GALT due to a change in family circumstances and no fault of his own. He is ready to resume the search for his forever couch! Duke is cat trainable - he is ignoring the cats in his foster home, but as always with introducing new kitties, use caution and a muzzle. 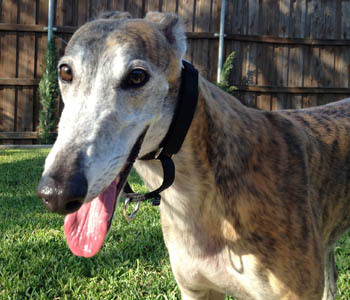 Duke is a very sweet and loving boy who very much enjoys being with people. He isn't a velcro dog but likes to follow me from room to room and find a nice comfortable place where he can observe everything. If you call his name and pat the floor next to you he will lie down for petting. If you scratch his neck he will crane it out as far as it can go, tilt his head to the side, and lift his ears. He REALLY loves a good neck scratch! He is a slow eater but has no food aggression. He has never had an accident in the house and does not counter surf. He rides well in the car, jumping up and down with no problems. He sleeps through the night and when the alarm goes off in the morning he greets you with a cold nose! Have I mentioned he's cat safe? He got a good sniff of one of my cats the first day he was here and has since ignored them both. This boy is PERFECT and is just looking for the perfect home for him!